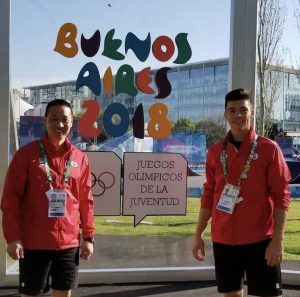 Winnipeggers and CSCM athletes Ethan McClymont and Erika Vermette recently returned from representing Canada in the Youth Olympic Games held in Buenos Aires, Argentina from October 6 – 18, 2018. 4000 athletes from 33 different countries participated in the games. Team Canada sent 72 athletes and took home 11 medals including one gold, three silver, and seven bronze. McClymont, a student at Vincent Massey Collegiate, captured bronze in the men’s 73-kilogram taekwondo event. 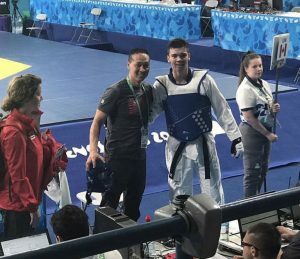 He had previously won a gold medal at the 2017 Pan Am Cadet Games. He is a member of the Sports and Arts program, offered through Vincent Massey Collegiate in partnership with CSCM. The program provides support for high performance athletes and artists, by allowing students to stay present and up to date in the classroom while still training and competing in their sport. Ethan trains with Jae Park, his coach of 7 years, from TRP Taekwondo and Hapkido Academy. He says that he hopes that he can inspire people through his story for their own journeys. It gave me a lot of pride to see them raising the Canadian flag for something that I had done for my country. Congratulations to CSCM athlete Ethan McClymont for bringing home a Bronze medal! Ethan has been working with our strength & conditioning staff three times per week for nearly a year now. Way to go, Ethan! Erika Vermette, a St. Vital resident, competed in Beach Volleyball alongside her partner Dana Roskic from Etobicoke, Ontario. Advancing to the round of 24, they fell to the team of Lisbeth Allocca and Medalyn Mendoza from Peru. They also recently represented Canada at the FIVB Beach Volleyball World Championships held in Nanjing, China from June 26 to July 1, 2018.